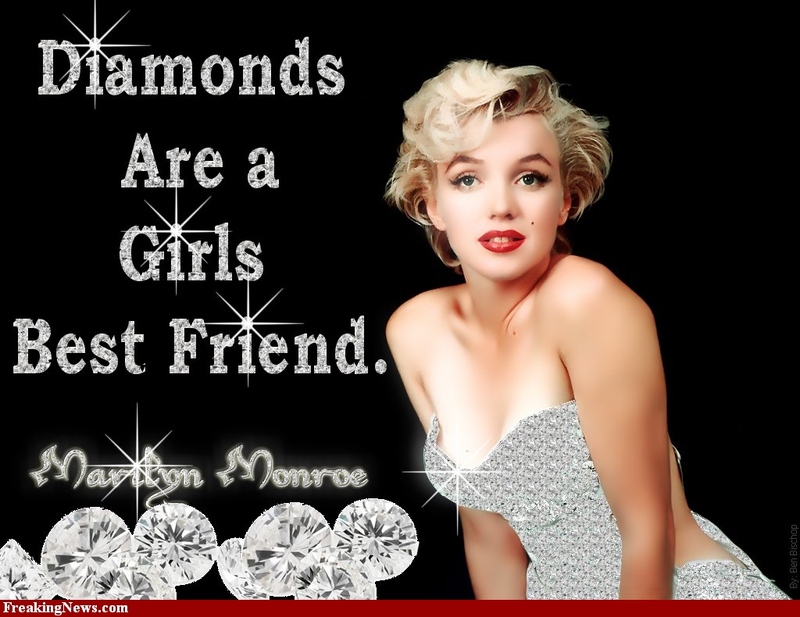 I’ve heard it said that diamonds are a girl’s best friend. Isn’t that what Marilyn Monroe sang? can't you just hear her singing? I like diamonds. What little girl hasn’t dreamed of the day when she would get a diamond engagement ring? I’ve always aimed high, so can you blame me if I always dreamed of getting this? Needless to say, I didn’t get it. So, if I can’t have the Hope Diamond, I’ll put my money on BLING that I can afford. 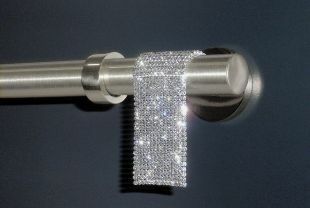 That BLING of course, goes on my couture window fashions. I thought it would be fun to share some examples of how BLING can be incorporated into your designs. When I was in Paris last year at the Maison et Objet, I found this Italian hardware company, CasaValentina. Not only do they have drapery rods with LED lights in them, they have a line of roller shades with the neatest operating mechanisms. 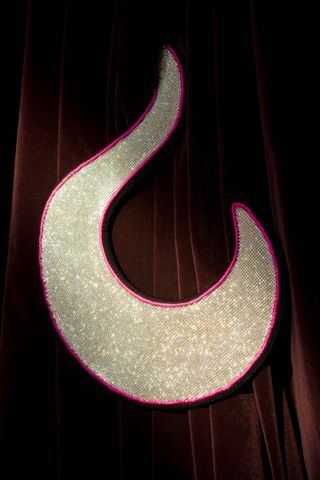 They are hidden behind beauty, one of which is this gorgeous bracket made of Swarovski crystals. How’s this for BLING? 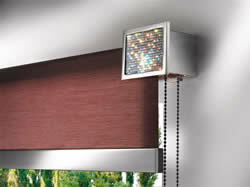 The Sirio Colection of rollup blinds. Photo courtesy of website. Next up we have a hardware line from Canada, Prestige Decor. I found them online actually in a search and was totally enamored with the jewel encrusted hardware. I apologize that these pics are small, but I copied them from their website. Please, please, please, go to their site to see for yourself because at least you will get a bigger image to ooohhhh and aaahhh over! These are called drapery scrolls which I would use as holdbacks for draperies. Your drapery would not be too fancy, maybe a nice pleated silk interlined panel so that the attention getter would be this holdback. Prestige Decor drapery scroll. Photo courtesy of website. Or how about this crystal and pearl attachment? I could definitely see it at the crossover point of swags or even on a tieback. How about you? Prestige Decor crystal attachment. Photo courtesy of website. Here is another example of a holdback, simpler in style but definitely not lacking in beauty. Prestige Decor pearl crystal holdback. Photo courtesy of website. This is absolutely gorgeous. Don’t know what it is? It is a bracket! At the left end, there is a post that you can mount your rod on so it flows seamlessly. Prestige Decor jeweled bracket. Photo courtesy of website. I know you recognize this! It is the picture at the top of my blog! This was a project I did for the Oaks Cloister in Philadelphia. It is the Dining Room. You can see at the top left corner of the pic the beautiful frieze, hand gilded and painted. In addition, the windows have this beautiful ironwork in them and I didn’t want the window treatment to take away from any of the splendor already in the room. So I chose a very simple treatment, but jazzed it up with BLING! You will see crystal medallions in the center of the cascades and jabots in addition to bead trim on the bottom edge of the swags and the graduating leading edge of the cascades. Very simple, yet stunning in person. These are the actual medallions and bead trim that I used as seen in the D’Kei sample book. I used the lower medallion and instead of the red center, I chose the cream to match nicely with the silk charmeuse fabric. Next up is this beautiful crystal collection from Orion Ornamental Art. It is their Bohemia Collection and there are many styles and sizes to choose from. Orion Ornamental Art Bohemia Collection finial. Photo courtesy of website. Today, I just installed these finials on a project of my own. They were the perfect size for the job too. Orion Ornamental Art Bohemia crystal finial. Photo courtesy of website. 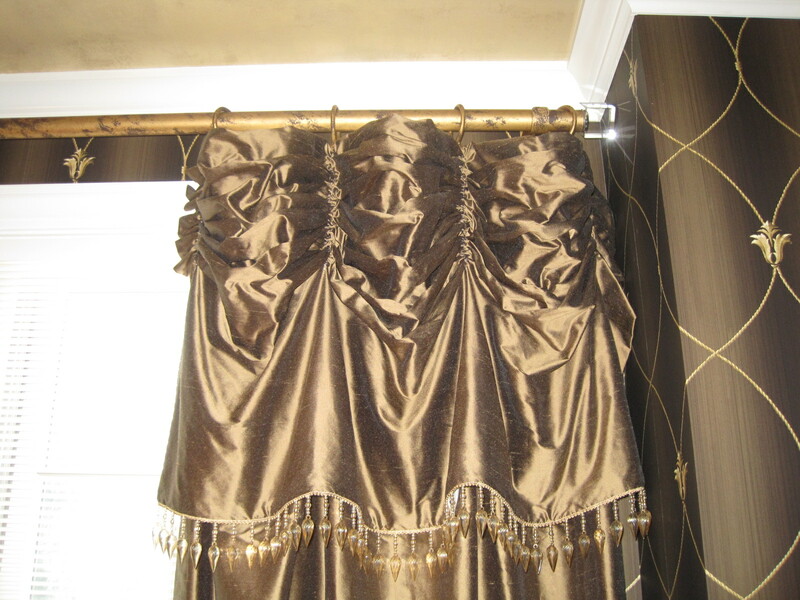 Here are the silk interlined panels with a ruched valance attached at the header, or top of the drapery. 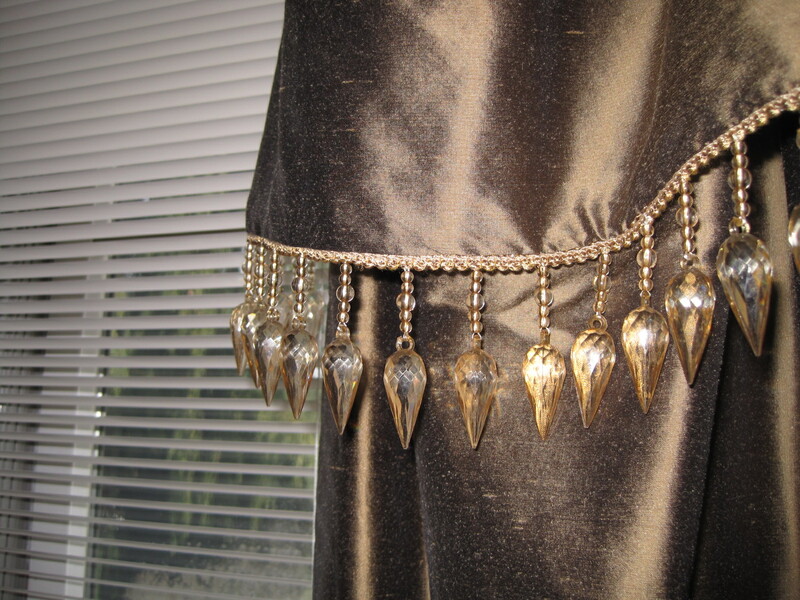 I also added some BLING in the form of bead trim inserted between the silk and the lining. 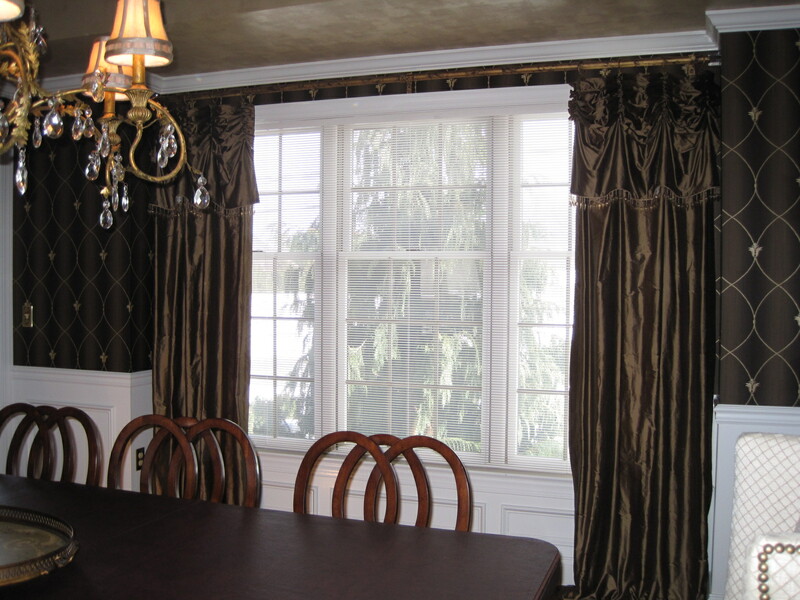 We did not want to see the braided header of the trim and only wanted the beads to appear gracefully brushing the panels. Notice the shine from the finial as the flash struck it. Bead trim from the D’Kei Chicago Collection. Available from designers. And now the room shot. See the BLING hanging from the chandelier too? These next 2 darlings match the personality of their creator: Kay Blair. One day last April I believe, I got a phone call from Kay. This was the first time I had ever talked to her but I definitely knew of her. Why? Her gorgeous mouth blown and handcut 24% lead crystal finials. She proceeded to tell me that she loved my work and I’m standing there thinking to myself: Woo Hoo, Kay loves my work! She asked if I would be attending the IWCE in Atlanta in May and I said most definitely as I had a booth myself promoting my own line of finials, La Finial. We arranged to meet up. Kay Blair radiance crystal finial. Photo courtesy of website. Cut to Atlanta: I love Kay! She was so helpful to me, stopping by my booth to see if I needed anything. I was so busy the first day I couldn’t get away for lunch so she brought it to me! What a sweet gal. So I am seriously hoping that I will get a job in which I can use her finials. It has to be the right room, the right treatment so her finials can elegantly be brought to the fore and highlighted. Kay Blair emerald crystal finial. Photo courtesy of website. And now, for a real adventure and delight to the visual senses we have the creations of Rémy Lemoine Passementerie d’Art, Paris. I had the pleasure of meeting Rémy last year while in Paris attending the Maison et Objet. We met up at the Musée D’Orsay and walked down the street to a wonderful restaurant and had lunch. It was a great lunch because some of the girls in my group joined us and the conversation was so colorful. Of course it had to be, because we are all colorful ladies in our own right! Doesn’t this make you think of Ali Babba and a flying carpet? 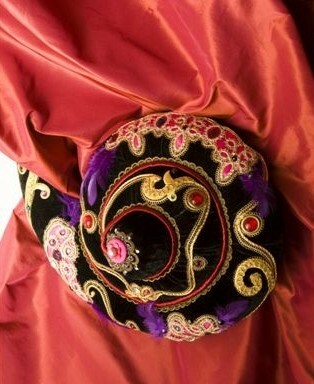 It is a beautiful velvet with hand sewn jewels, feathers and embroidery. I was able to see this magical holdback when he met us for drinks and brought along some of his creations. Seeing is believing and to see these gems in person was a delight to my senses. Oh how I just want to use this somewhere in my designs! 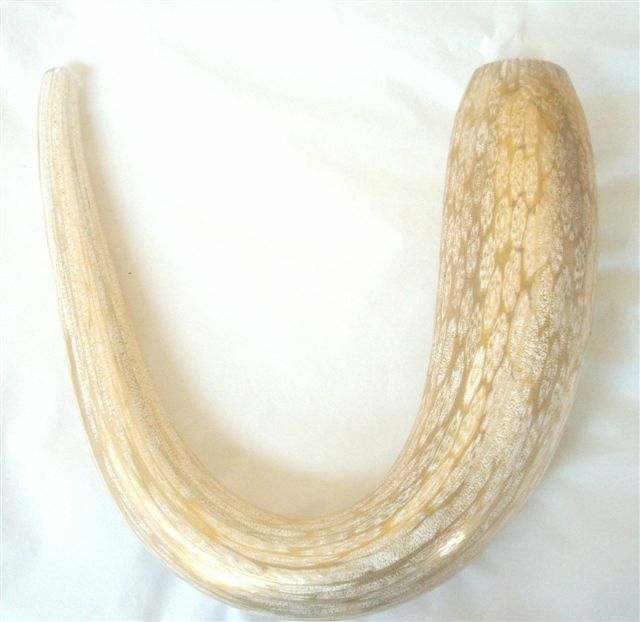 This beautiful holdback is made from Murano glass from Italy and is white murine on gold. It is fairly heavy and trust me, I handled it with kid gloves! And now? This is my display in the Philadelphia Marketplace Design Center. You will see the beautiful Embraver Miroir holdback on my table. After meeting with Rémy and his lovely wife Yamina the last night before I was to leave Paris, he graciously allowed me to bring over to the States, these two Murano glass holdbacks! I was giddy! Felt like I just got the Hope Diamond! This is a pic showing how the Embraver Miroir is installed. Absolutely stunning, is it not? Last but not least, this company is S-System from Greece. I LOVE their line of sleek, contemporary hardware. Again, these photos were taken from their website, so please go to their site and see for yourself just how beautiful they are. This is very elegant and understated, yet, says a lot doesn’t it? What is it telling you? 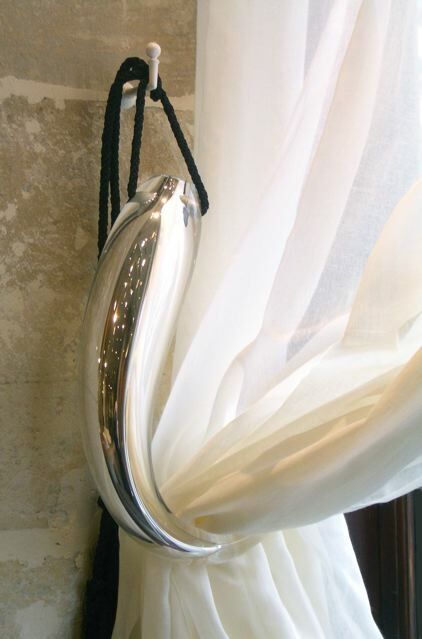 In a dreamlike voice it’s saying, call Tammi, she will make the most FABulous draperies for you with this hardware! S - System fnial. Photo courtesy of website. 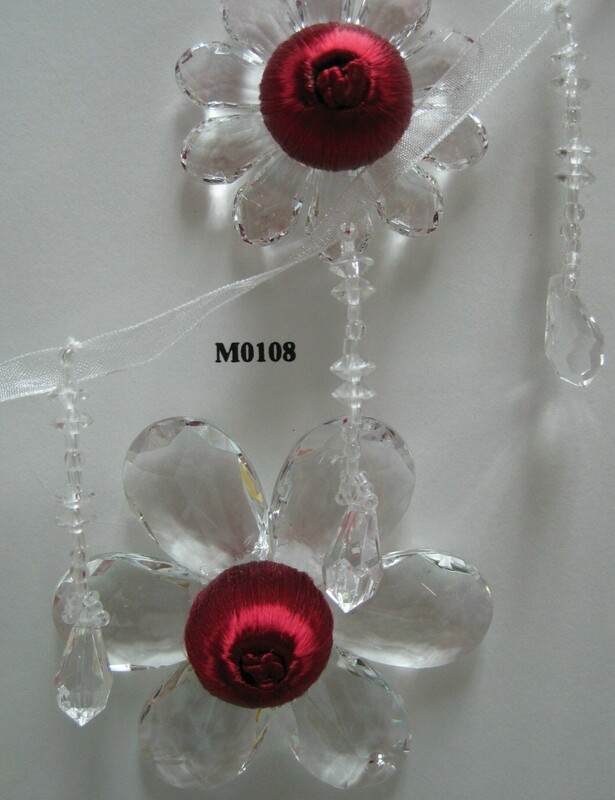 Are these crystal droplets to die for? S - System droplet finial. Photo courtesy of website. And the pièce de resistance for me? This baby! I could totally be Scarlet O’Hara and wear this proudly! S-System swarovski drape finial. Photo courtesy website. So guys and girls, we’ve been to Canada, California, Illinois, France, Italy and Greece. 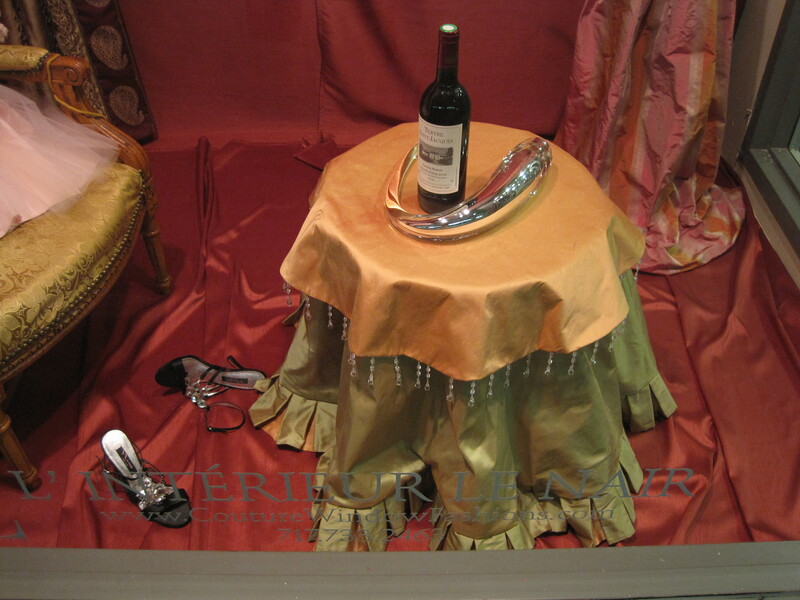 Not everyone gets a Hope Diamond, but fortunately, you can have BLING for your couture window fashions! After reading my blog post this morning, I got an email from Rémy Lemoine. He informed me of a new holdback design of his which is over the top BLING! Check out his new Sogni holdback encrusted with Swarovski crystals! This is a totally custom product because you can change out the hot pink border to any color of your choice! 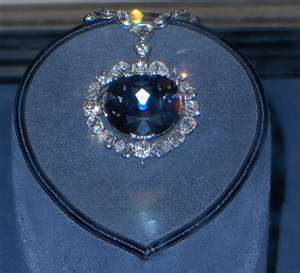 So, Hope Diamond…..or Sogni Swarovski………you decide! I love your Marylyn as introduction… and I wish to realize one day a design with diamonds and diamonds….for one of your project….. I would love to wok on a project with you that incorporates diamonds! But if I can’t have diamonds, then your Sogni bathed in Swarovski crystals will definitely do the trick. I am going to add this little gem to my blog. Thanks for stopping by and commenting! Tammi, What a fun post! Two more additions to your bling collection – beaded and sequined hardware from Saturday Decor (is that their name?) and the jeweled nailheads from D’Kei. And ADO used to have their lovely sheer w/Swarovski crystals sprinkled over the bottom third of the drapery. I did actually supply K Blair finials for a job several years ago. The fabric was a beautiful green/gold embossed silk, simple necklace swags and tails, and her wonderfully faceted crystal finials really enhanced the gold drapery rods as well as the fabric! I will have to check out Saturday Decor. Yes, those jeweled nailheads from D’Kei are gorgeous and in my mind, I have some great ideas for them! I remember the ADO fabric too. Do they still have that in their line? I haven’t checked my book lately. Do you have any pics of the install you did with Kay’s finials? I would love to see it. If they made real diamond drapery hardware, I’m sure I’d be the first crazy designer trying to talk a client into “real” jewelry for her windows… But those Prestige Decor Swarovski crystal pieces run a pretty close second to the real deal. I LOVE the “drapery jewelry” pieces and wonder if they can be attached independently of the other hardware. Do you suppose they could be pinned onto fabric treatments like a brooch? Thanks for sharing this resource! YOU and I would both be the crazy girls to suggest diamonds on our window treatments! Unabashedly, I might add! In fact, as I was writing this, I was wondering just which young starlet would be as captivated as me by having a boudoir with girly bling! I think a few emails are in order here! I stumbled upon Prestige and am so glad I did! If you ever get to use this, send me pics and I will post as a follow up to this post. I was thinking that the jewelry could be placed randomly on a treatment, either hand sewn, or clipped on somehow. I love the brackets because a nice slim stainless steel rod would look great between the bling. Thank you Alicia for visiting my blog and commenting! The crystal holdbacks do make your heart skip a beat, don’t they? Hey there, that is truly an incredibly good web site today! I value a well updated guide. Amazing but where can I find the S-System swarovski drape finial.